The poetry is a valuable source of information about life in the abbeys during this period. Several are mentioned in the poetry of Guto’r Glyn but special attention is given to two Cistercian abbeys, Strata Florida and Valle Crucis. 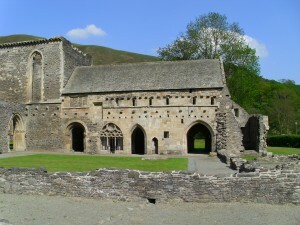 Abbot Rhys ap Dafydd of Strata Florida seems to have been Guto’s most important patron when he was young, and when he was older he sang several poems for Abbot Dafydd ap Ieuan of Valle Crucis, who offered him shelter during his final years. He also visited Shrewsbury abbey (poem 77) and Strata Marcella abbey (poem 82, poem 115). During his visits Guto noted how spectacular the buildings were, describing their structure, architecture and decoration in detail. His poems, and those of his contemporaries, also describe the tradition and culture that flourished within the abbeys’ walls. They refer to activities such as feasting, handling manuscripts and praying; the traditions and customs which were associated with the life of an abbot, a monk or a visitor to these monasteries during the fifteenth century.